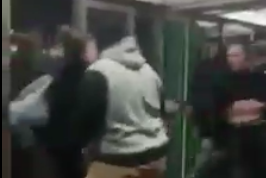 A video of a brawl reportedly involving local school students is circulating on social media. SEPTA Transit Police are investigating a brawl apparently involving local students that took place Thursday afternoon at the Race-Vine station of the Broad Street Line subway. Cellphone video footage shows about a dozen teens involved in the violent scene, with at least one boy shown lying on the ground and being kicked by several others. In another snapshot, viewers can see students engaged in hand-to-hand combat while others use their phones to video the fight. Both girls and boys appear in the video dressed in school uniforms and wearing backpacks. A SEPTA spokesperson said at least one student involved in the altercation was taken to a nearby hospital and treated for not life-threatening injuries. There have not been any arrests, at this time.